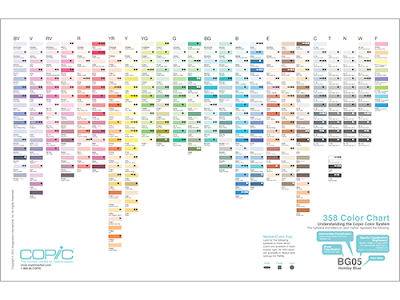 If you are new to Copics, the Copic Numbering System can seem a little confusing. But it's quite simple once you get to grips with it... you'll be rattling off numbers before you know it. Before we talk about numbers, you should ignore everything you are about to read when it comes to the Earth group of colours. They have their own party and ignore all the number rules, being sure to do their own thing. The first number ranges from 0 to 9. This number indicates the vibrancy of a colour. 0 is very vibrant and as you move up towards 9, more grey is added to tone down the brightness of a shade. For example, B04 is a much brighter and more vibrant version of blue than B95. The second number ranges from 0000, includes 000 and 00 and increases to 10. This number signifies how light a colour is within that range. For example, B91 is lighter shade of the 9 group than B99.